June 2012’s Astrological Cluster! Bottom Line Guidance for Venus-Sun Transit Square Mars with Neptune Retro, and Direct Saturn’s Dance in the Heavens! I’ve seen this coming and have a pretty good idea now that we’re into June how this is playing out in my own life but we still have the whole month to get through! After reading this well-written article [http://www.astroraven.com/astrology-news/item/12-a-perfect-storm?-the-transits-of-june-2012] about the astrology of June: the Venus thing with the Sun squaring Mars and Neptune and Saturn and full Moon Lunar Eclipse and lions and tigers and bears, O my! I’m looking to divination for overall bottom line guidance. What would the i-ching say to us if it could (and it can as soon as I toss the coins) about June 2012? What is the most important thing for humanity to keep in mind in consideration of all these astrological gymnastics occurring this month? Well, no lines were changing in the toss, so the guidance is pretty straight forward. We’re talking about Kua 53 called “Development” and relates to that old saying “a journey of a thousand miles begins with a single step”. So right away here we get the feeling that we should be patient during the month of June; one step at a time apparently but STEP! (Don’t NOT step). There is also the feel here of two separate parts uniting; so we have a feeling of people working together. I am hearing that old song in my head, “People who need people are the luckiest people….” Walk the walk with others during the month of June and stay flexible—that’s the other bottom line. But wait! There’s one more and that’s to stop worrying about the future and the way you do that is to remain in the present moment with your mental attention. Should you find yourself in a tizzy about the future, instead do what needs doing with all your full attention in the present moment. This keeps you balanced and that is a word for June—balance! Keep attention on the balance point within you and do whatever you need to in order to maintain balance. Keep your cool in the face of anything you’d label a delay or set back—whatever happens this month, don’t check out! Look at life straight in the eye and then feel supported—it’s a choice. Choose to feel supported rather than in any way fearful or worried. In Wu Wei’s Book of Answers, Kua 53 is called “Gradual Development” and the advice from this kua is that things will develop slowly and as a consequence become strong and enduring. Keep that in mind over the month of June 2012 also. Any situation that is currently being developed in your life now will require thoughtfulness, attention to detail, and social correctness in which integrity serves you well. The future will be prosperous and peaceful if you maintain balance and a positive attitude. Hang in there! I will if you will ~! 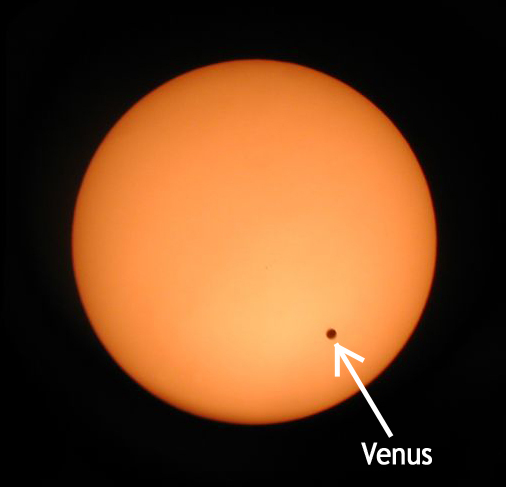 On June 5 or 6, depending on where on the planet you live, Venus will cross the face of the Sun. As it merges with the Sun, all that Venus represents (values, desires, personal needs, love, etc) will be transformed by the Sun or will transform the Sun itself! What does our Sun represent to our psyche astrologically? Some say it’s our essence; others say its our ego/personality; some say Sun represents father energy or male energy (while the Moon represents female energy–in that way) and others say the Sun represents our life purpose. In all models, all planets revolve around that Sun and a healthy Sun in our psyche is what helps us feel whole, complete and happy. No matter which way we see the Sun astrologically, there’s about to be some transformation through the Venus occulation that is occurring this week! This planetary alignment of Venus crossing over the face of the Sun is called an occultation [see image]–some simply call it the ‘transit of Venus’. Venus visibly seen in front of the Sun is a symbol for the rise of feminine energy in a current patriarchal world; so male/female issues and patriarchal values versus spiritual could be brought forward. To emphasize this even further, during the occultation, Venus/Sun will be forming a square to Mars. Squares are what are called ‘hard’ and ‘challenging’ aspects, and Mars is the male counterpart to Venus. 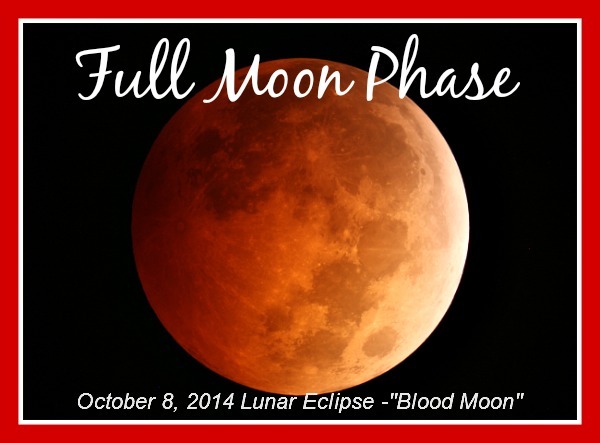 To add to the intensity, this occurs within a day of a Lunar Eclipse, which will affect us emotionally. PS — Venus is in Gemini retrograde, so there will be dialogue about these topics this week, even if some of it may be internal! Roles of male versus female needs in relationships; my values versus your values; patriarchical values versus matriarchal/spiritual values; consensus level consciousness and values versus spiritual level; new world values may very well be implanted, seeded, boosted or reawakened the consciousness of the human at this time. How will it affect your personal life? Stay tuned, it should be an interesting week ahead! Go with the flow! 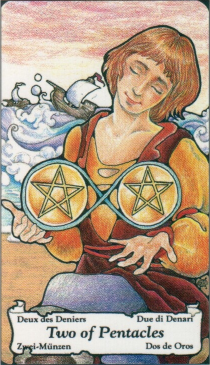 Today’s divination message is inspired by the 2 of Pentacles—the same archetype as Jupiter in Capricorn. I have to laugh as I think about it, especially since this is the day of the Lunar Eclipse Full Moon and looking at the picture on the card to the left. Look at the ocean in the background in the image—lots of waves and rough water. Astrologically, water relates to emotion and that is an element affected by the Moon (the tides). The message for today seems like this: do whatever you have to do to stay afloat in rough (emotional) seas! In astrology terms, Jupiter will intensify or magnify (enlarge) whatever it contacts. Since the 2 of Pentacles relates to Jupiter in Capricorn and since Capricorn energy is thought to correlate with ‘control’, we could say that to go with the flow is one way to control the emotions today. Capricorn relates to Earth too, so grounding would be a good idea today. If the emotional nature is too intense (Jupiter) connect with grounding activities or earth energy (Capricorn). The oceans of life may be wild today since it’s a Full Moon Lunar Eclipse, so balance that by coming ashore so-to-speak and connecting with Mother Earth. Today, you may be especially challenged to maintain equilibrium through the changes of life. If you have been stuck in old conditions, this Lunar Eclipse time (and the Eclipse Season generally) will help you clear out some of the old sludge—sediments may rise to the surface as water (emotions) get stirred. You can use this time to your advantage however (see yesterday’s 6-14-11 post). We are being reminded now that we have an opportunity to create a stronger inner self by developing inner strength and fortitude. Dance with the rhythms of the universe and flow with eternal changes of life! And cut other’s some slack today if need be. Like Plato said, Be kind, for everyone you meet is fighting a hard battle. PS– the Lunar Eclipse energy refered to above and in yesterday’s blog isn’t negative in any way, shape or form and may manifest in each of us differently. Nothing is good or bad OR better or worse–what is, simply is. The current astrological configurations feel (to me) unusually pleasant and very calming… Easy Like Sunday Morning as the song lyrics go. The Moon! Spiritual and physical evolution is the focus of today’s divination message. 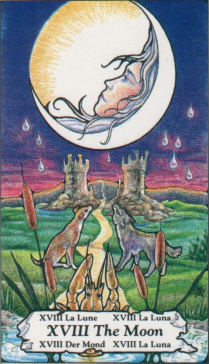 How interesting to have drawn this card just the Full Moon Lunar Eclipse is upon us. The Moon opposes the Sun now challenging us to determine our own truth verses the lies we tell ourselves—in the form of denial. Are we being in spiritual integrity? The archetype of this card is Pisces, the unconscious mind—some say Pisces represents universal mind. But either way, the Moon is about the shadow—parts of ourselves that contain motivations and fears of which we either deny or of which we are unaware. The Moon card of Tarot represents forces that shape our lives—forces that are greater than own thoughts which guide our evolution. And these are the feeling and emotional forces that are responded to from our ego or personality selves. Full Moon times are great times to meditate. We can, through the help of the higher energies that it is possible to access during meditation, view our emotions and feelings without getting lost in them. Moon energy represents what is within the subconscious and the unconscious parts of ourselves–the shadow or hidden material. In astrological terms we would say 12th house stuff–that’s how Pisces gets the association with the The Moon Card. Pisces,ruled by Neptune, is the natural archetype of the 12th house. It is said that during Full Moon times, plants go into a deep meditation. It’s a time for spiritual retreat and the plant kingdom seems to know that. That sounds like Native American folklore and whether there is any scientific proof of that, I don’t know; but I’ve heard that before. I suspect it may have something to do with moisture levels and the ocean tides due to gravity shifts but don’t quote me on that—it’s my own speculation. What I can say, however, is that many times I get what I call “Full Moon Headaches” during certain Full Moon times and many memories that I’d thought I’d forgotten surface from the subconscious during Full Moon’s. It seems like the deeper levels of mind are easier to access during powerful Full Moons and this is why its a good time to meditate—you may tap into memories and insights better then. Dealing with the past and issues or aspects of our lives where we are in fear, denial or struggling with an illusion or delusion are often exposed during Full Moons. The element of water is associated with the Moon and emotion. Water, water everywhere! The Moon card is associated with Pisces which is a water sign and the Moon itself is ruled by Cancer, another water sign. Thus, the strong emotional correlations by water. And the obviously increased emotional states during Full Moon times are no secret to anyone dealing with the general public—as you know, hospital workers and police force personnel tell us about it all the time. So, we may be challenged to determine what we believe, what our personal truth ‘is’, and we may be challenged to express or communicate (Gemini) that truth in a way that is evolutionary or in new ways, different ways than in the past. Why so? Because, this Full Moon is triggering each of us in a way that is working with our own personal soul’s karmic past and evolutionary intent. Why? Because the Moon/Sun opposition is sitting on the transiting Nodes of the Moon themselves! Whatever is happening in your life now and in the next few days especially is going to give you clues as to your life purpose—what you are here to heal and where your soul intends to evolve. It would be good to pay attention to challenges and insights that are part of your life right now. That is, if you want to know the answer to those universal questions: Why am I here? What is my purpose? You will get major clues to that through dreams and meditations and plain ole’ life experiences right now. Whatever is going on in your life right now – it’s one huge clue to be applied as an answer to those life purpose types of questions. As this Full Moon is also a Lunar Eclipse, so there will likely be some new imprints on the soul that occur at this time. Eclipse energy is known to impact our destiny—it can be a time to make a new covenant with the universe. When the Earth passes between the Sun and the Moon (like it’s about to do now), we have a Lunar Eclipse and again, the Sun is in Gemini and the Moon is in Sag and through the open window of an eclipse, information can pass through into the soul and the soul can release energy out as well. Energies are released and received and in this case the energy has to do with the archetypal energies of Gemini and Sagittarius (truth versus lies). The Earth is in the middle of the Sun and Moon and these two opposing Luminaries are creating a tug and pull within us—contractions, like giving birth to new energy. The magnetic pull of the Sun and Moon eclipsing the Earth is strong enough to open the Earth’s sheath temporarily so that these energies can be received and released. Again, think of it like an open window, perhaps a portal. Our beliefs (Sag) will be changed and the way we communicate (Gemini) those will also be affected. And in whatever way that happens for you personally, you will be able to put 2 + 2 together to understand what your own soul is trying to achieve so that you can work in harmony with it, instead of against it. Observe and correlate. If you are one who asks questions like, Why am I here? What am I supposed to be “learning” or doing? What is my purpose? You’re getting some great big hints right about NOW! Whatever that is, it’s connected to what you are doing here and how your soul is trying to resolve, grow and evolve– just notice. The forces of nature! The Wheel of Fortune—which is in astrology terms, Jupiter! The cycles of our lives, the turning points and the change and moving back to “center” where there is stability and spiritual nourishment—that’s the focus of today’s cosmic communiqué. 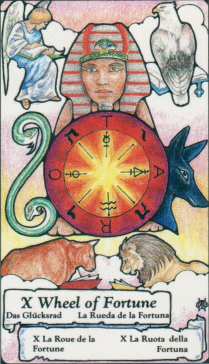 This Wheel of Fortune card is appropriate for the current astrological weather—a Lunar Eclipse full Moon in Sagittarius is approaching (the 15th) triggering the transiting Lunar Nodes in Gemini/Sag and we will all be visiting the truth (Jupiter/Sag) versus lies (Mercury/Gemini) energy in our lives and our communication methods may receive some restructuring. 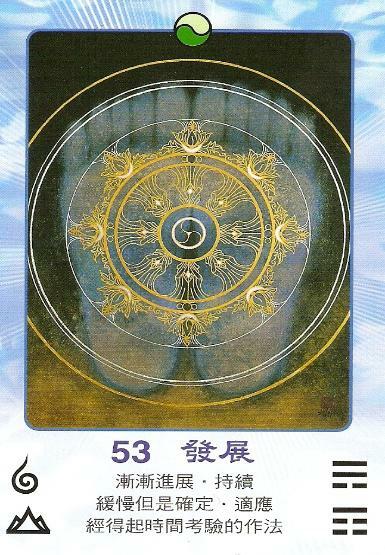 The Wheel of Fortune card reminds us that our lives are affected by cycles and those can be seen clearly in astrology. It is important that we remain centered when these cycles are occurring and when we are being imprinted with new energy, which happens during eclipse seasons, like now. Even though our life may feel like it is doing a turn around, it is an opportunity to become more aware and to realize how everything connects in ways that greater perspectives can be gained. While we have free will to set our own path in life to a certain extent, we do experience twists of fate and larger cycles that affect us, despite our best efforts. At these times, we feel clear that there is a greater power in charge of our lives and to surrender to that can help us realized that there is a bigger picture (Jupiter). When we surrender our will to a more Divine Will and/or acknowledge a greater plan is at work in our lives which we simply cannot control it is humbling, and at the same time it can also be gratifying. Standing back and seeing the larger perspective (Jupiter) is what today’s message is about. The amount of surprise or resistance that we experience now is an indication of how well we are surrendering to The Divine energy of life. The only certainty to life is change and—as above, so below—we can see that literally if we study astrology. In the difficulties of life is where we grow if we work in harmony with change. There is freedom to make choices in life but these are within the confines of the workings of fate or the soul’s plan—and we can get glimpses of that plan in a natal birth chart. If this is a particularly good time for you, the works of your past are probably being enjoyed right now. If you are experiencing a down time, ride the cycle and go with the flow and try to work with it, seeing the bigger picture. Good or bad is a judgment, life will always be cyclical in nature—up’s and down’s; it’s all relative. And nothing lasts forever, life IS change; so hang in there! If this is a challenging time for you, the good news is that it will pass. Do what you can to turn the perceived misfortune to fortune by seeing the bigger picture (Jupiter) and c;ll on your intuition to help you bring balance. I love that this card comes up today just as we are approaching the Full Moon Lunar Eclipse in Sagittarius, ruled by Jupiter. The approaching Full Moon will be sitting right on the transiting North Node that is in Jupiter ruled Sagittarius. 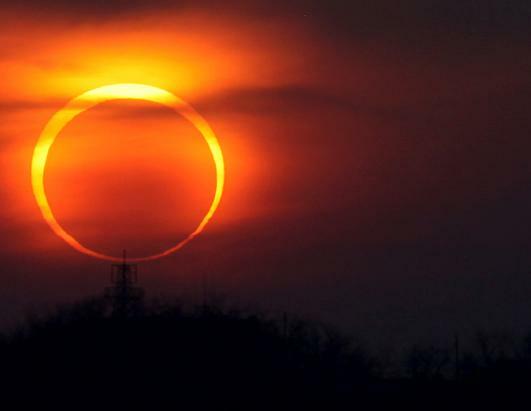 The eclipse is activating these issues of truth versus lies and issues of seeing the big picture. The Wheel of Fortune card today is calling to our attention the current and upcoming astrological influences. What is truth? Is it black and white? The Gemini part of this eclipse wants it to be. But the truth is relative and we must integrate all we’ve learned thus far in order to be able to really realize that. Eclipses always trigger emotions and with the transiting nodes involved, what’s going on involves communications regarding truth vs. lies because the transiting nodes are in Gemini/Sag. Final thought: not everyone has to agree with your truth in order for you to feel emotionally okay.